A Foxy Vanity Fare: My vanity is parallel to my style; vintage glam. The bowl, birdcage, and branch-detailed brass mirror are all vintage pieces. The bowl holds my hefty sunglass collection, but only a few pairs are in heavy rotation for this summer. My Voluspa candles are nested in the middle of the cage, and their scents are beautiful when lit together or individually. The bust is a great centerpiece to my vanity (a gift given to me by Emily), and it often gets the most use of my biggest, brightest pieces. 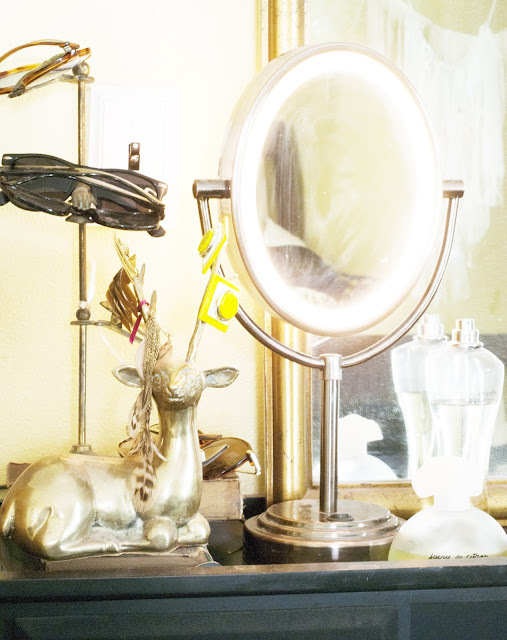 Much like my personal style, my vanity is always evolving, collecting and rotation. 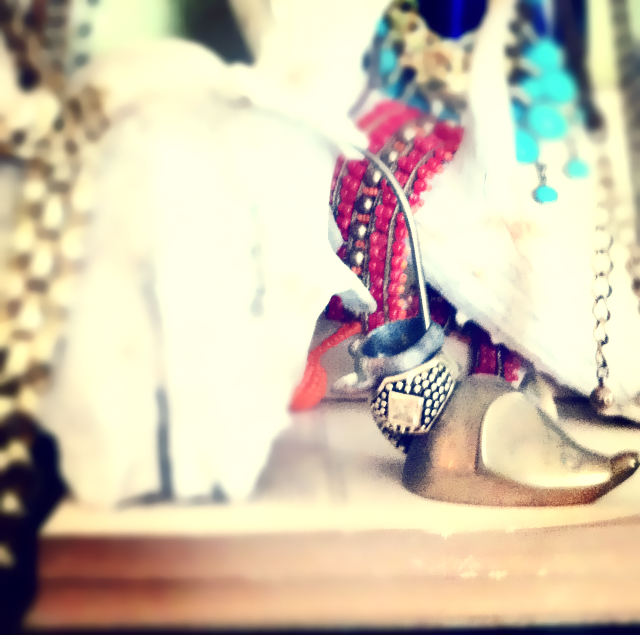 A Gypsy Vanity Fare: My vanity is much like my personal style; Vintage Boheme. I love the various juxtapositions in my vanity displays; touches of beauty with edgy elements. 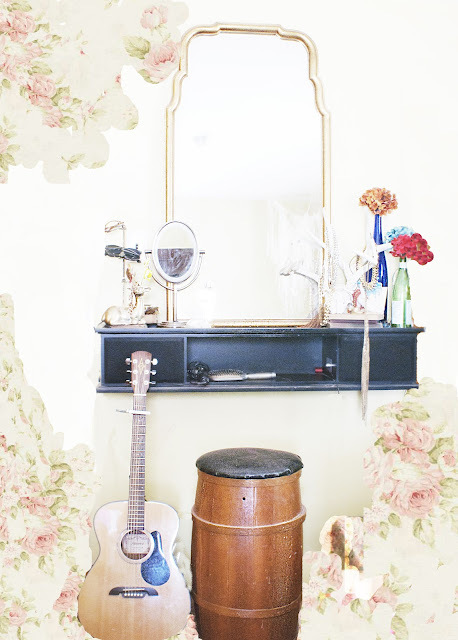 It's relative to my personal style; a very vintage feel with a little bit of modern flair. 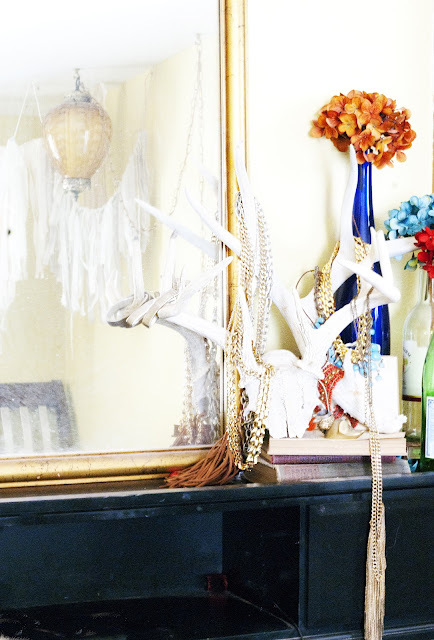 It is adorned with brass animal jewelry holders, antlers with floral pops and antique wine and perfume bottles.